We get a lot of questions about cost and speed of projects. Every project has 3 key points which determine how we’re going to produce your printed project: price, quality, and turn-around time. The services and specialties at each print shop vary. With an enormous number of products available, there is no single print shop that can provide every single variable of low cost, high quality and fast turn-around. That’s why we’ve partnered up with the best local, state, national, and even world-wide printers to provide each customer a customized experience based on their particular needs. 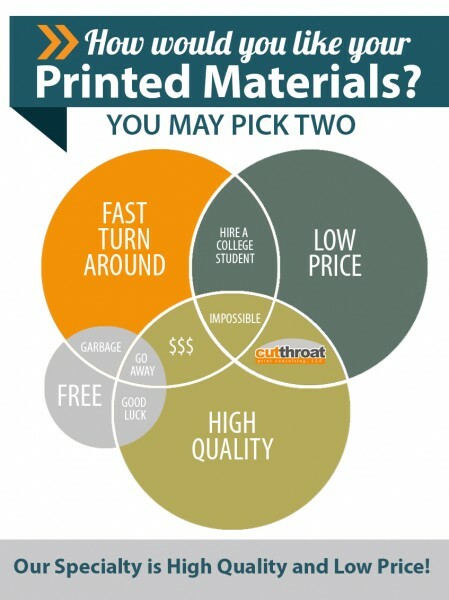 Cutthroat Print Consulting places a strong emphasis on low price and high quality offset gang-run printing, which is great for customers wanting a low-cost high-quality product. With this formula, the turn-around time factor must be considered, as most gang-run projects typically take 6-10 days to be printed and have shipments received. If you’re in need of your projects quickly, we offer several rush options. However, as you can deduct from the print circle to the right, it will increase the price by as much as 500%, and sometimes lessen the quality of your stock or print options. Time is money – and in the case of printing – giving us enough time to complete your project at the same time we’re completing other projects of the same quantity and stock type by warehousing them together, you will definitely money. The most expensive part of any printed project is by far labor. Paper and ink are relatively inexpensive at the quantities printers buy them at. Hiring experienced qualified machine operators that can quickly and effectively use complex industrial machinery to complete a print project is costly, but assures quality, speed, and reduces waste. Machines in print shops are scheduled on a print calendar. Each job is scheduled on which machines will be used to complete that particular job. For example, a standard tri-fold brochure that gets mailed can use 6 machines, and sometimes even more: Printing: printer, coating, Bindery: cutting, folding, Mailing: tabbing, mail service. 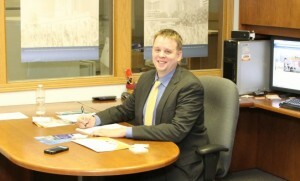 As the print calendar fills, jobs take longer to complete. As you can imagine, moving all of the jobs on the print calendar to complete the rush job above is a logistics nightmare and creates chaos in the flow of a print shop. When a rush order comes in, all other jobs must take a back seat to the rush jobs. That’s one of the reason rush fees can be so costly. #1: Price: How does Cutthroat Print keep prices so low? 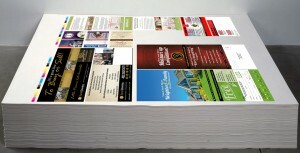 We don’t specialize in the traditional one-at-a-time small project printing. Instead, we offer gang-run printing that saves you an enormous amount of money. Gang-Run printing allows us to print several customer’s orders on one large sheet of paper at once, then cut them down all at the same time, saving us hundreds of hours a week on expensive labor costs – savings we pass along to our customers. By offering a select number of paper stocks (that fit most projects) and a select number of quantities (500, 1000, 2500, 5000, etc. ), we can gang-run your project with other customer’s projects, allowing us to “bulk” several projects at once, and pass the savings onto you. Our gang-run methods work on all of our standard products listed on our website, and include things like brochures, postcards, rack cards, business cards, doorhangers, letterhead, envelopes, greeting cards, presentation folders, catalogs, booklets, and banners. While gang-run printing saves money, it might also take up to 6-10 days to receive your printed materials, which includes the UPS ground shipping time for your project to arrive. Your business deserves to look as good as it can be. That’s why the standard stocks we offer with the best prices are high-quality stocks, like 100# gloss book stock (like a magazine cover) and 14pt. gloss cover with UV coating. Request a swatch sample from our website if you’d like to get more familiar with our standard stocks. We sometimes get special requests for stocks that are outside our standard selection. Typically, because we aren’t gang-running specialty stocks and coatings like silk, raised printing, etc., these projects can cost as much as five to ten times more. Offset VS Digital Printing: Our standard products are all run using offset printing. This is a method that requires 4 physical printing plates to be created: Cyan (blue), Magenta, Yellow, and Black (CMYK). Setting up any project on a 4-color offset press takes time and requires a specialized labor force. The end result is an extremely crisp and brightly colored printed material. Alternatively, digital printing is typically lower quality, and is produced similarly to a laser color printer. Our rush jobs that are lower quantity are typically completed using digital printing because of the enormous set-up cost of offset printing for a single job, but the quality is definitely not nearly as good as offset printing. #3: Turn-Around Time: When do you need your project? Planning ahead saves you money. We encourage you to take advantage of huge savings by talking with us at least two weeks prior to needing your printed materials in hand. The more time you give us, the more we can save you.